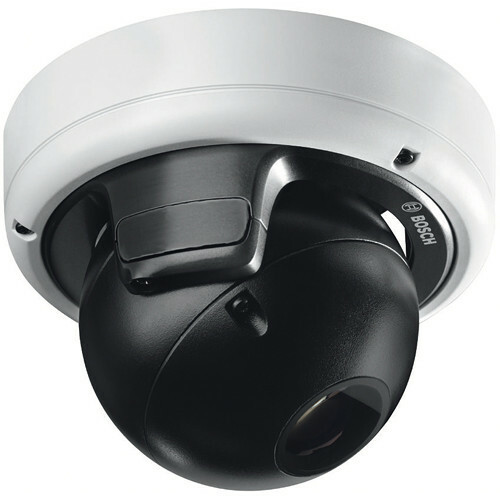 The Bosch NDN-932V02-IP FLEXIDOME HD Dome 1080p HDR Camera combines intelligence with adaptive video processing to bring you high performance, content-based imaging in any security or surveillance scenario, day or night. This camera uses an internal feedback system based on the intelligent analysis of the scene to re-tune video processing. This provides better detail in the areas that matter and better all-round performance. With HDR (High Dynamic Range), you can view details in the bright and the dark areas of a scene at the same time. HDR is based on a dual exposure process that captures more details in highlights and shadows even under challenging lighting conditions. The result is that you can distinguish objects and features easily. C-BIT (Content-Based Imaging Technology) uses IVA information to examine the scene and provide feedback to re-tune image processing. C-BIT identifies areas for enhanced processing and ensures crisp, clear, and detailed images in difficult lighting conditions. For example, the iAE (intelligent Automatic Exposure) allows you to view moving objects in bright and dark areas of a scene. iDNR (intelligent Dynamic Noise Reduction) actively analyzes the contents of the scene to reduce bandwidth and storage requirements. This removes noise artifacts so effectively that compression efficiency is very high (up to 30% improvement). This results in reduced-bandwidth streams that still retain a good image quality and smooth motion. This camera captures usable images by cleverly optimizing the detail-to-bandwidth ratio via temporal and spatial noise filtering. Compression parameters for up to 8 user-definable regions can be set. This allows uninteresting regions to be highly compressed, thus lowering bandwidth consumption and storage requirements. Important regions can be tuned for good image quality, thus allowing the user to allocate bandwidth to important parts of the scene. This camera comes with a choice of tele, mid-range, and ultra-wide angle lenses (sold separately). This varifocal SR (Super Resolution) lens have an advanced iris design to ensure that the high resolution HD sensor captures sharp images, even in the corners. The optically corrected ultra-wide angle lens provides good performance without the need for developing software. This camera has a very intuitive user interface that allows fast and easy configuration. Six configurable user modes are provided with settings for a variety of applications: Outdoor for general day-to-night changes with sun highlights and street lighting, Indoor for general day-to-night changes without sun highlights and street lighting, Motion for monitoring traffic or fast moving objects; motion artifacts are minimized, Lowlight for optimized for sufficient details at low light, Intelligent AE for people moving in front of a bright background, and Vibrant for enhanced contrast, sharpness, and saturation. An auto-focus lens wizard makes it easy for an installer to accurately focus the camera for both day and night operations. The wizard is activated from the PC or from the camera making it easy to choose the workflow that suits best. The automatic motorized back focus adjustment with 1:1 pixel mapping ensures that this camera is always focused accurately. The innovative multi-streaming feature delivers various H.264 streams together with an M-JPEG stream. These streams facilitate bandwidth-efficient viewing and recording as well as integration with third-party video management systems. A corridor mode can be selected for the second stream. In this mode, an image of 400 x 720 (9:16 aspect ratio) is cropped from the full sensor image. When the scene to be monitored is suitable to this mode, the bandwidth and storage requirements are reduced. A microSD card (sold separately) can be used for local alarm recording or for ANR (Automatic Network Replenishment) to improve overall recording reliability. Recording management can be controlled by the Video Recording Manager (VRM) or the camera can use iSCSI targets directly without any recording software. The IVA system is a guard-assistant system of choice when reliable indoor or outdoor video analytics is needed. The state-of-the-art system reliably detects, tracks, and analyzes moving objects while suppressing unwanted alarms from spurious sources in the image. The best face detection feature detects faces in the scene and forwards a high quality JPEG image of the best shot of each face when the face disappears from the scene. Retrospective forensic search capabilities are available remotely from the web browser or the Bosch Video Client. Two ROI (Regions of Interest) can be user defined. The remote electronic pan, tilt, and zoom controls allow you to select specific areas of the parent image. These regions produce separate streams for remote viewing and recording. These streams, together with the main stream, allow the operator to separately monitor the most interesting part of a scene while still retaining situational awareness. The IVA intelligent tracker can also follow objects within the defined regions of interest. The intelligent tracker can autonomously detect and track moving objects or the user can click on an object which the intelligent tracker will then follow. Up to 3 levels of password protection and 802.1x authentication are supported. To secure web browser access, use HTTPS with a SSL certificate stored in the camera. The video and audio communication channels can be independently AES encrypted with 128-bit keys by installing the encryption site license (sold separately). There are many ways to access the camera's video and IVA-based features: using a web browser with the Bosch video management system, with the Bosch recording system, with the free-of-charge Bosch video client, or with the iPad App. The Bosch Video Client PC surveillance software offers a user-friendly interface to support easy installation and configuration. It also provides easy live viewing of multiple cameras, playback, forensic search and export. Access to IVA metadata is available to integrators via RTSP. The Bosch video security iPad app has been developed to fully utilize dynamic transcoding features and enable anywhere access to HD surveillance images, even over low-bandwidth connections. The App, together with the Bosch transcoder, is configured to give you complete control of all your cameras, from panning and tilting to zoom and focus functions. It's like taking your control room with you. This camera conforms to the ONVIF (Open Network Video Interface Forum) Profile S specification, which guarantees interoperability between network video products regardless of the manufacturer. For trouble-free network cabling, this camera supports auto-MDIX, which allows the use of straight or crossover cables. This camera power is supplied via PoE (Power over Ethernet) or via the 24 VAC / 12 VDC connector. Third-party integrators can easily access the internal feature set of the camera for integration into large projects. Visit the Bosch Technology Partner Program (TPP) website (tpp.boschsecurity.com) for more information. This camera is used in variety of applications such as tunnels for viewing details in bright and dark areas, entrances and exits for identification with strong backlight, and in traffic for capturing moving vehicles at night. Box Dimensions (LxWxH) 10.394 x 10.394 x 8.347"